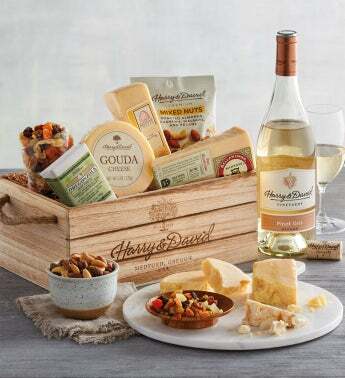 Packaged in a sturdy wooden crate, this Gourmet Cheese Gift with Wine is specifically designed for the cheese aficionado. 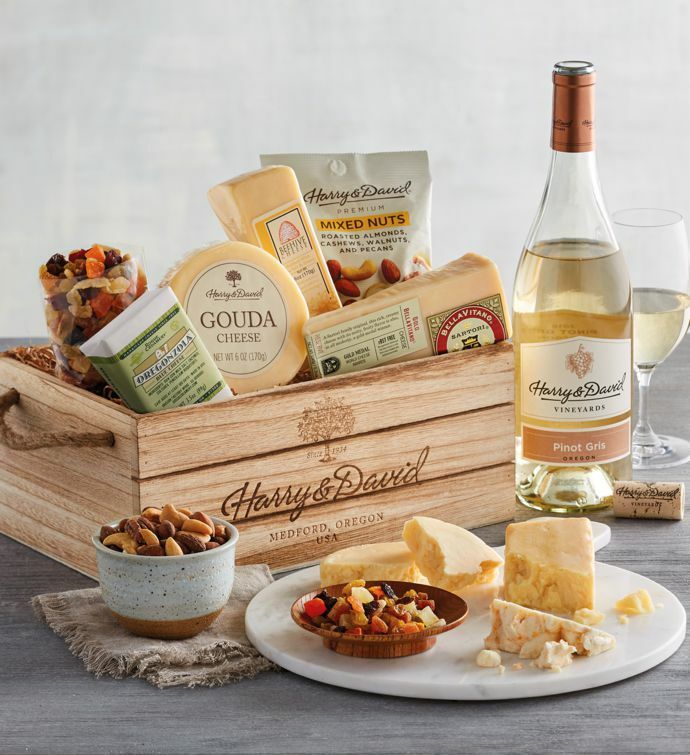 We've assembled four superior cheeses with a bottle of 2016 Harry & David™ Pinot Gris and dried fruit and mixed nuts to create a pleasant and inviting gourmet snack spread. The SeaHive cheese, from Beehive Cheese Co., is a cheddar cheese hand rubbed with wildflower honey and sea salt for a salty-sweet combination with floral notes and a sharp cheddar bite. Sartori's BellaVitano Gold®, winner of the gold medal at the 2013 World Cheese Awards, is inspired by traditional Italian cheeses and has a rich nutty and fruity flavor. Gouda is one of the most popular cheeses worldwide, and it's not hard to see why. Smooth and subtle, it pairs especially well with nuts or dark chocolate. And lastly, from our neighbors up the road comes the Rogue Creamery® TouVelle® cheese, a full, creamy cheese that falls somewhere between cheddar, Jack and Gouda. It's an American original from a world-renowned creamery.